Note: This article was originally published in the October 2008 issue of the Denver publication Community News. Hello again, everyone! The heat of summer is gone, and fall is here at last. It won't be long before it's time to dig out those mixing bowls, heat up the oven, and get to baking pumpkin pies, molasses cookies, and other traditional fall and winter goodies. With that in mind, here's an article on the benefits of some common spices and herbs, from cinnamon to ginger to thyme to turmeric. So go get yourself a cup of peppermint tea, then relax and enjoy the read! 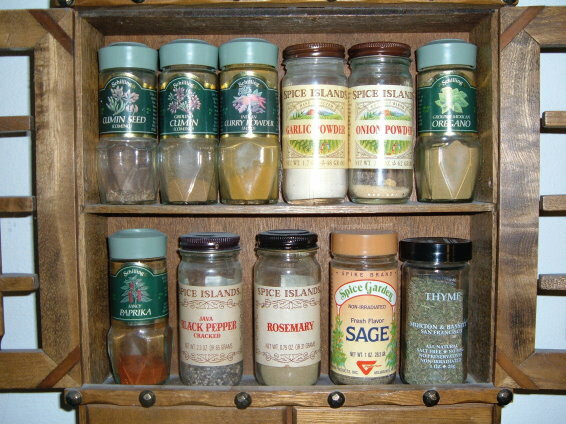 Botanically, herbs and spices are classified as fruits and vegetables. They've been used in cooking and for medicinal purposes in many cultures throughout history. They're high in antioxidants because they no longer contain the water that makes up such a large part of fresh produce. They can add a lot of flavor to food, making it less likely that you will need to add fat, salt, or sugar in order to make your food taste good. Their nutritional content can be quite impressive. One teaspoon of ground ginger has as many antioxidants as a cup of spinach. A teaspoon of thyme has as many antioxidants as a carrot or one-half cup of chopped tomatoes. A teaspoon of dried oregano has as many antioxidants as one-half cup of chopped asparagus. There is ongoing research into the ability of herbs and spices to boost metabolism, aid in weight control, and promote satiety (a feeling of fullness). Black pepper may be common, but it's a standout when it comes to health benefits. It improves digestion by increasing the stomach's secretion of hydrochloric acid. It helps prevent the formation of intestinal gas and helps stimulate the breakdown of fat cells. It's also an antioxidant and supplies manganese, iron, and fiber. Cinnamon, an extremely popular spice, comes in more than 100 varieties. I've always loved it; buttery cinnamon-sugar toast and my mother's small, dense cinnamon rolls were two of my favorite childhood treats. But ever since I was diagnosed earlier this year as pre-diabetic, I've appreciated the well-documented ability of even small amounts of this spice, as little as one-quarter teaspoon per day, to help reduce blood sugar levels in people with type-2 diabetes. Other benefits of cinnamon include the reduction of cholesterol levels and triglycerides and some antioxidant activity. Just smelling this wonderful spice can boost brain function and reduce irritability. It also supplies manganese, fiber, and iron. Besides using it in baked goods, try sprinkling it on coffee, toast, yogurt, or cottage cheese. It can give an interesting twist to the flavors of chicken and ground meat. Cloves are the unopened buds of an evergreen tree. They can be used as a pickling spice or to make drinks such as mulled wine. A warming spice, it can help relieve congestion. Clove oil relieves a toothache. The eugenol in the oil is antiinflammatory, and can help relieve the stiffness and pain of arthritis. Ginger, common in many Asian cuisines, has been eaten for more than 4,000 years and was one of the first spices traded in western Europe. It can help ease motion sickness and inhibit vomiting; in 1983, the British found that powdered ginger is twice as effective as Dramamine. It can help ease the side effects of chemotherapy. Gingerols (compounds in ginger) also appear to have an anti-inflammatory effect, which can help reduce the pain of arthritis. It also supplies potassium. One ounce of ginger root has only about 20 calories. Try ginger with meats, poultry, sushi, and some desserts. I enjoy an occasional cup of ginger tea, available in health food stores. On the side of their box of "Ginger Aid" tea, Traditional Medicinals (a brand I've praised in previous articles on teas) states that ginger tea "promotes the flow of digestive juices." Try this pungent, somewhat spicy beverage with a bit of honey, agave nectar, or liquid stevia. Here's a list of herbs and spices that can aid digestion: allspice, anise, cardamom, cloves, dill, ginger, marjoram, oregano (effective against Giardia), peppermint, and tarragon (known to relieve gas). Thyme is one of my favorite herbs. If you have not yet tried cooking with it, don't be put off by the fact that thymol, which is thyme's most active ingredient, is in products like Listerine and Vicks. That's because it has antibacterial properties. When inhaled, thyme oil can help loosen phlegm and relax the muscles in the respiratory tract. Thyme is a common ingredient in Mediterranean dishes, and it's great with beef, lamb, or pork. Try adding it to stuffing, spaghetti sauce, pizza sauces, or chili. It can enhance any cheese, tomato, or egg dish. Once in food, it releases its full flavor rather slowly, so add it early in the cooking process. When dried, thyme retains its flavor better than many other herbs do, so dried or powdered thyme makes a perfectly good substitute for fresh thyme. Turmeric is a main ingredient of curry. You can buy turmeric in capsule form if you don't like its taste. It can reduce the risk of gallstones, and also has anti-inflammatory properties. Like yogurt, it can help reestablish beneficial bacteria in the digestive system after the use of antibiotics. There is considerable evidence that it has anti-cancer properties; Indian men, who eat a lot of curry, have a low rate of prostate cancer.